The 18” Izy is great for medium size gardens with lawns up to a tennis court in size. The HRG 465 combines manoeuvrability with a large diameter 18” (46cm) cut, is able to cover the ground fast. The high quality durable steel cutter deck finished in rose champagne has been redesigned to deliver optimal airflow, resulting in outstanding grass collection into a large capacity and easy to empty grass bag. Which this allows you to do fewer trips to the compost heap and gives you more time to sit back and enjoy your garden. Honda’s Easy Start means what it “says on the tin”. Honda’s Auto Choke system ensures the perfect engine start setting whatever the weather making the recoil pull action effortless! 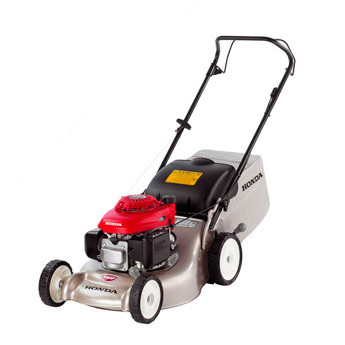 Honda’s powerful GCV 135 4-stroke engine is easy to the ear with a 30% noise reduction due to a revised blade design and also delivers a smooth power to the blade with less vibration than similar engines. The Honda is environmentally economical with low fuel and oil consumption that meets the world’s strictest anti-pollution standards. Maintaining and storing the Izy is a doddle. With rounded cutter housing with no nooks and crannies for wet grass to stick to and a simply one action folding handle which allows storage in the smallest of spaces.